Flo (Flores) McGarrell, an American artist and gender activist, was born in Rome, Italy on August 31, 1974. He died in Jacmel, Haiti in the earthquake of January 12, 2010. As a student at Maryland Institute College of Art in Baltimore (1993-1997) his work and interests quickly moved from figurative painting and drawing to huge inflatable sculptures, and pursued this interest during graduate studies at the School of the Art Institute of Chicago. His first one-man show was at he Lisa Dent Gallery in San Francisco (2004). For the last three years of his life, he focused attention on projects for sustainable living: "Agrisculpture,"
art center. He had been deeply interested in Haitian art and culture since childhood. 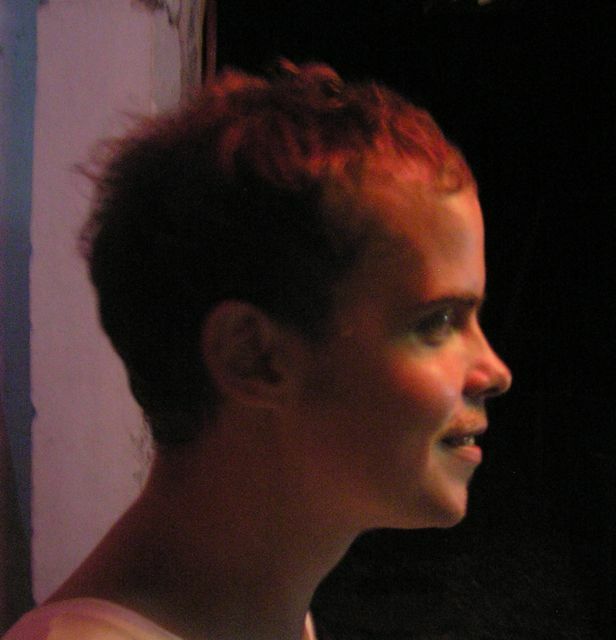 He was art director of the film "Maggots and Men" (2005), and at the time of his death had produced a short film based on Kathy Acker's Kathy Goes to Haiti as participation in the 2009 Ghetto Biennale of Port-au-Prince. He also exhibited at the AVA Gallery and Art Center of Lebanon, New Hampshire. His life and untimely death inspired the creation of a new art center in Jacmel (Jakmel Ekspresyons) and the film le Jour y Est by Claudel (Zaka) Chery. There are plans to rebuild Flo's site; in the meantime there is a capture of the site from the Wayback Machine.